We spotted Jessica DeCarlo’s booth almost immediately as we walked into the market. She had the most lovely geometric hammered metal designs and an inviting smile. At first I walked away from a lost wax cast adjustable ring with double ram heads, but had to come back for it. Chris and I are both Aries, so… face off? Jessica’s studio is nearby, and you can also find her pieces in local shops in the area when the market is closed. If you can’t make it to Brooklyn, they’re also online. Still loving this lost wax ring! Lost wax is the coolest. These photos stopped for sure. Of course I love the ocean photos. Well, they’re technically watercolor paper prints. It looks like the photographer, Matt Schwartz, takes a Polaroid photo and then transfers it onto watercolor paper while it’s still developing, and then blows them up large scale depending on the project. His wife was manning the market booth this Sunday, keeping the photos safe from the teasing raindrops. They travel all over the world taking these photos and completing projects for various commercial, restaurant & hospitality, and residential clients. What an adventure! While not technically in the Dumbo market, this store is a story in itself. Deena brought me by here on our way back to the subway. Siva, the shop owner, sells jade gemstones, feng shui products, jewelry & more. Stop in and find a stone that calls to you, and he’ll help you understand it’s auspicious nature before doing some cleansing spirit magic on the stone and sending you into the world with it. Deena found a piece of jade here to help her bunny journey into the afterlife when it passed away. Since they’re friends, he reluctantly let me take this photo of him. 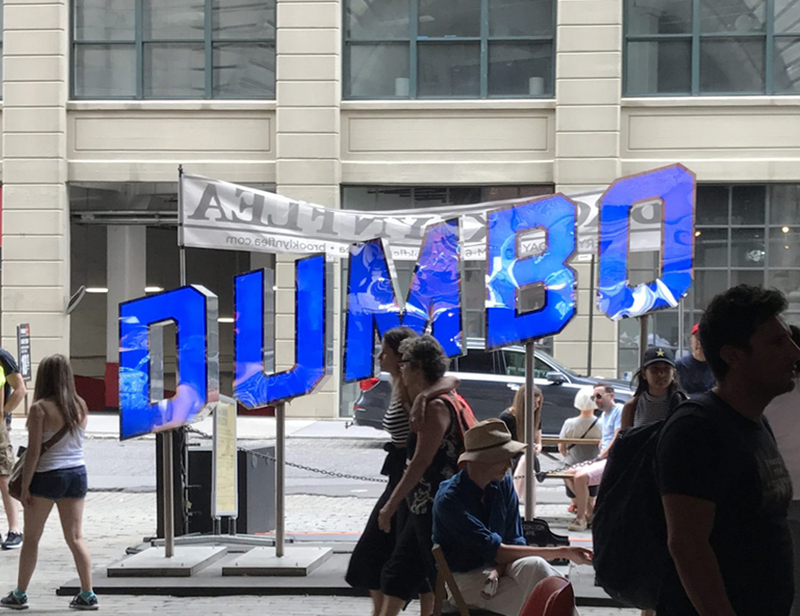 Anyway, the Dumbo Flea Market in Brooklyn was quite an adventure for us! Here are a few more photos from while we wandered through the neighborhood and up to the Brooklyn Bridge.